In this historical photo from the U.S. space agency, Alfred J. Eggers served as NASA's Assistant Administrator for Policy from January 1968 through March 1971. After that he accepted a position as Assistant Director for Research Applications at the National Science Foundation. 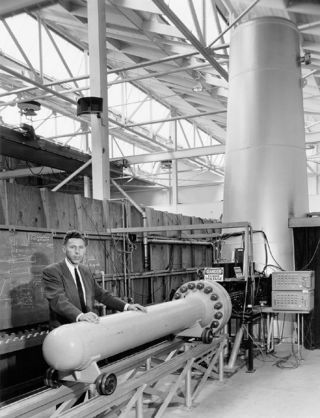 Dr. Eggers came to the NACA (National Advisory Committee for Aeronautics) Ames Aeronautical Laboratory in 1944 from the Navy's V- 12 college program. In 1954 he was made Division Chief of the Vehicle Environment Division. This Division was comprised of a physics branch, an entry simulation branch, a structural dynamics branch, the 3.5 foot hypersonic wind tunnel branch and the hypervelocity ballistic range branch. In 1958 Dr. Eggers headed up the Manned Satellite Team which was to consider design problems and propose a practical system for a satellite while recommending a suitable research program. This ultimately lead to Ames developing and managing the highly successful Pioneer program. Dr. Eggers specialized in hypersonic and spaceflight research including the development of new wind tunnel and ballistic range facilities. In May of 1964 Dr. Eggers was appointed Deputy Associate Administrator for Advanced Research and Technology.